Winter weddings are beautiful, unique, and tough to plan. While getting married in the winter can be an advantage (it’s off-season for many venues and vendors and you may get some discounts! ), it can also be really hard to nail down the logistics. 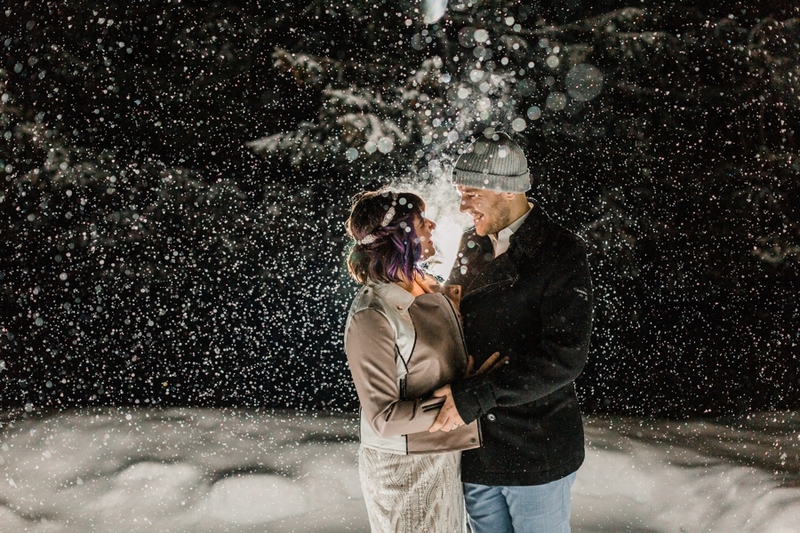 I’m here to give you some of my best tips on how to plan a snowy winter wedding. 1. Wear the right winter footwear. If you’re planning to have your winter wedding ceremony outdoors in the snow, take this opportunity to find a stylish and warm set of snow boots. You can change out of these for the reception but you’ll be so happy you have warm toes during your ceremony and photo session. I have always been a fan of my Sorel boots (going on 9 winters and counting!) and love the look of their Joan of Arctic boots. Don’t forget a tall pair of winter socks as well. My favorites are Smartwool PhD Ski Socks. 2. Invest in lovely winter wedding accessories. This is your excuse to get that beautiful fur coat or shawl you’ve always wanted! Accessories like a wool coat or shawl not only look great for outdoor winter wedding photos, but they keep you nice and toasty warm. Also, don’t forget about your bridesmaids! Purchase them scarves or shawls in your wedding colors as bridesmaid gifts that they can wear for the outdoor portions of the day. They’ll be happy to have a warm layer that looks good in photos and keeps them warm! A few of my favorite winter wedding accessories are this BHLDN sweater wrap or these shawls from Sissily Designs. 3. Keep your guests comfortable. Think blankets draped over ceremony chairs or a basket of hand-warmers as they enter. If you choose to have your winter wedding ceremony outdoors, be sure to consider the comfort of your guests. Make sure you have a warm place for them to gather (and maybe a hot cocoa station!) before the festivities begin. 4. Keep everything in one location. When planning a winter wedding, look for a venue that doesn’t require travel between the ceremony and the reception space. This way your guests won’t be required to travel on dangerous snowy roads and will keep the whole event flowing if there happens to be inclement weather. 5. Find a venue with lodging nearby. Similar to number four, the more you can keep your guests from having to drive themselves, the better. If your venue isn’t close to lodging, consider hiring a shuttle service to transport you and your guests to the nearest hotel with or town with lodging. Some of my favorite winter wedding venues in Washington are Pine River Ranch, Sleeping Lady, Mountain Springs Lodge, and Swiftwater Cellars. My favorite winter wedding venues in Jackson Hole are Jackson Hole Mountain Resort, Grand Targhee Resort, Hotel Terra, Spring Creek Ranch, and Amangani. Think candles, dried flowers, woodsy foliage, and lights hanging from above. Maybe you’re getting married in a rustic lodge and can drape lights from the ceiling beams, or fill your tables with tea lights and taper candles to set the stage for the perfect winter wedding vibe. There are so many unique and beautiful ways to decorate your venue in a way that celebrates the season! Due to the fact that the sun sets early in the winter, be sure to plan your ceremony at a time of day when there will be enough light. On that note it is also best to do a “first look”, so that you’ll have enough light to take all of those winter wonderland photos you’ve been dreaming of! 8. Have a coat check and boot storage. If you’re ceremony is outdoors and your reception is indoors, this is a must! Many guests will likely wear snow boots if standing in the snow and want to change into their dancing shoes once they get inside. Set up a coat rack and rubber mat for guests to store their outerwear when they enter the reception space. This will keep coats and clutter off or your reception space and allow more room for your guests to be comfortable. 9. Send your guests off with winter favors. There are so many fun ways to celebrate winter and sending your guests off with winter wedding favors allows for so much creativity! Some of my favorite ideas are personalized mugs with hot cocoa fixins, a s’mores kit, or even cozy winter blankets in your wedding colors. 10. Near a ski resort? Plan a post-wedding ski session! One of my favorite ideas, being the snowboarder that I am! If you love to ski and got married near a ski resort, why not plan a post-wedding ski session? Your photographer can come up with you for a couple of hours the day after your wedding and capture you having fun on the slopes and celebrating your first day as newlyweds! Thanks for reading and I hope this gives you a lot of great ideas for planning a winter wedding! If you’re getting married in the winter and looking for a photographer, be sure to ask about my winter wedding special! I offer all couples getting married in the winter months an additional hour of coverage to their wedding collection for no extra charge. Email [email protected] for pricing and availability. I look forward to hearing about all of your winter wedding plans!